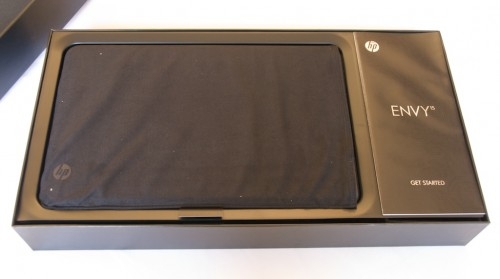 "As configured, the HP Envy 15 is the most powerful five pound notebook on the market. As you can see in the image below, this envy 15 comes with an Intel Core i7-720QM processor, dual 160GB solid state drives, 16GB of DDR3 RAM and ATI Mobility Radeon HD 4830 graphics with 1GB of deicated graphics memory." I'm eyeing the HP Envy 15 for my next laptop - my XPS M1330 is starting to feel a little aged, though it still stacks up nicely against most other notebooks in the spec department - so I'm eager to read everything I can about the Envy 15. It blends the opposing traits of a powerful CPU with great battery life by including the battery slice in the box, which is excellent - it's one less thing to buy. I've seen the Envy 15 in person and there are two things I'm iffy on: the 1920 x 1080 resolution is really high for a 15.6 inch screen, and I'm not sure if bumping font sizes (or the DPI) would be enough to make it workable. The second thing is HP, for some bizarre reason, went with a very "girly" floral-style pattern on the lid. I hate the way it looks, so I'd be looking to slap a decal from DecalGirl on there right away...which seems ridiculous to me. I'm not aware of any other laptops out there that have the Core i7 mobile CPU but still manage decent battery life...any suggestions?